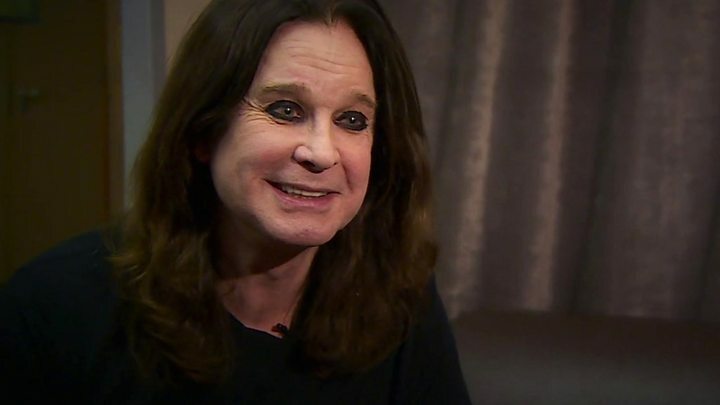 Rock star Ozzy Osbourne says he's "a whirlwind of emotions" as Black Sabbath prepare to play their last ever show. The band, who gave birth to heavy metal in the 1970s, are calling it a day with two concerts in their home city of Birmingham this week. "My emotions are flying all over the place," Osbourne told the BBC, as the band rehearsed at the Genting Arena. "Since I've got to this building today, I've been happy, I've been tearful. Let's see what happens." BBC Radio 1's Rock Show is broadcasting a Black Sabbath special on Sunday, 5 February. The group formed in 1968 under the awkward name the Polka Tulk Blues Band (a reference to a brand of talcum powder). They later changed their name to Earth before settling on Black Sabbath. Powered by Tony Iommi's seismic guitar riffs and Osbourne's primal vocals, they created classic metal songs like Paranoid and Iron Man, full of doom-laden, occult imagery. They also gained a reputation for chaos, with drug addiction and in-fighting derailing the band in the late 1970s. Osbourne quit in 1977 and was replaced by Rainbow's Ronnie James Dio - but the classic line-up made their way back under the stage lights in 1997 and have played consistently since. Over the years, their heavy blues riffs inspired hundreds of other bands, many of whom pay tribute in a Black Sabbath Special, which will be broadcast on BBC Radio 1 this Sunday, 5 February. "Black Sabbath mean everything to me," Scott Ian, of Anthrax told the station's Daniel P Carter. "You could say that for me Black Sabbath are the bible and each one of their records is another book of the bible that they wrote - the bible of heavy metal." "Some of the sickest music in the world has come out of Black Sabbath," added Bill Kelliher, of Mastodon. "People try to emulate them and they just can't." Osbourne said he was surprised and humbled by Sabbath's influence. "But at the same time, if they don't recognise me I get upset." The singer admitted he was feeling sentimental about his time in the band. "I remember playing the Crown pub in Birmingham and thinking, 'This'll be good for a couple of years - drink a few beers and have a jam'. But it was the beginning of the most incredible adventure you could think of. I've had the best life out of it. "One of the proudest things I have in my heart is the fact that Black Sabbath wasn't a band that was created by some big mogul. It was four guys who said, 'Let's have a dream', and it came true beyond our wildest expectations." The star confirmed that - unlike other bands - Black Sabbath's farewell tour was the definitive end. "This is definitely it," he said. "It's run its course." Osbourne added that his solo farewell tour in 1992 had been a mistake. "What I learned is you have to have something to retire to. So I'm going to continue with my solo thing. It's not a job, it's a passion." The band have suggested there will be a few surprises when they take to the stage for the last time on Saturday night - and one of them will be Osbourne's goodbye speech. "I've got to say something but I've nothing rehearsed," he laughed. "I'm no good at speeches." Fans who attend the gig on Saturday night will have their portraits taken and memories recorded, as part of the Home of Metal project. The project is also asking fans to contribute photos and memorabilia for an exhibition celebrating the legacy of Black Sabbath, which will tour internationally in 2018, followed by a summer season in Birmingham and the Black Country in 2019.